In one easy step, you can now apply both stain and polyurethane to your wood project using Varathane One-Step Stain & Polyurethane. Premium pigments provide deep, rich colour while Varathane's renowned polyurethane adds a smooth, even protective finish without brush marks. By combining stain and polyurethane together, Varathane One-Step Stain and Polyurethane saves time and allows you to finish projects faster. Minwax<sup></sup> Polycrylic<sup></sup> Protective Finish is a crystal clear, fast-drying protective topcoat for use over bare wood, oil- and water-based stains, paint and wallpaper. It has very little odour, is non-flammable, cleans up easily with soap and water, and can be recoated in only 2 hours. Minwax<sup></sup> Polycrylic<sup></sup> resists damage from abrasion, scuffing, chipping, water, alcohol and other common household chemicals. Bar & Table Finish pour-on finish; is an ultra-thick, high gloss, crystal clear epoxy that provides maximum durability. Ideal as a waterproof finish for table and bar tops, it is also great for crafts and refinishing furniture. Varathane Triple Thick Clear Finish is 3X thicker than a traditional polyurethane. It is an advanced self leveling formula that allows projects to be completed in one coat. 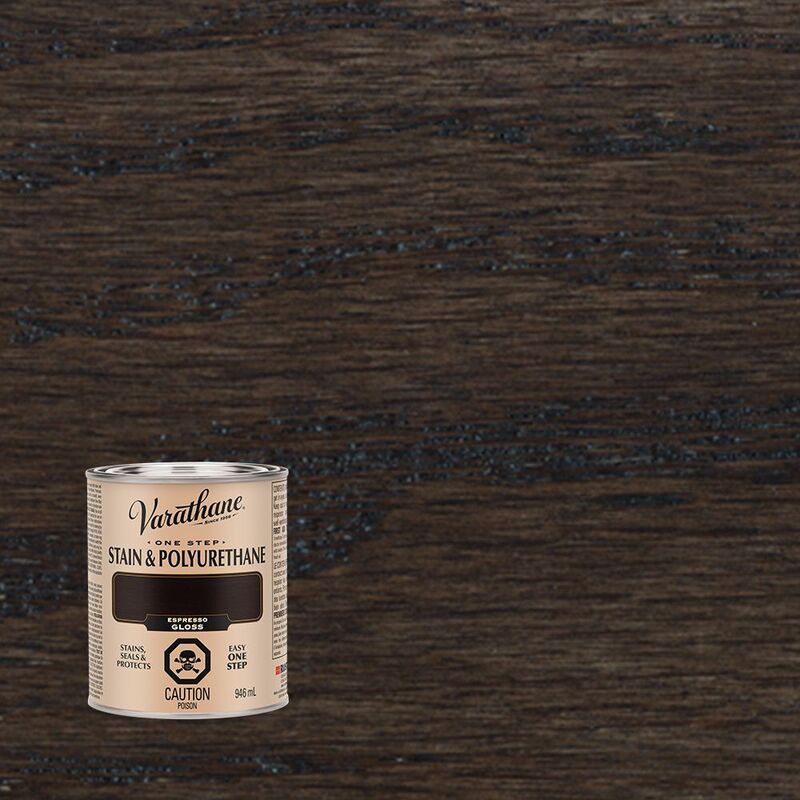 Varathane Stain & Polyurethane Satin Espresso 946ml In one easy step, you can now apply both stain and polyurethane to your wood project using Varathane One-Step Stain & Polyurethane. Premium pigments provide deep, rich colour while Varathane's renowned polyurethane adds a smooth, even protective finish without brush marks.